Of all the disasters that might happen in the near future, a nuclear war is the one I fear most. Not only are tensions between the United States and Russia higher than ever, the increasing number of Jihadists–who are not deterred by the threat of mutually assured destruction–means we are in more danger every single day. And then there’s North Korea, a country determined to develop missiles that can reach the United States, and no one knows how to stop them without causing a nuclear incident. Unfortunately, nuclear weapons cannot be uninvented, so it’s hard to see how their existence won’t eventually result in a worldwide disaster. Every year, the Bulletin of Atomic Scientists, a panel of experts who analyze how close the world is to being plunged into nuclear war, adjusts a clock known as the Doomsday Clock. The closer this clock is to midnight, the closer we are to nuclear war. In, 2017 the Bulletin of Atomic Scientists updated the clock to just 2 ½ minutes to midnight – the closest it has been since the height of Cold War in 1953. With the world in such an unstable place, it’s more important than ever to prepare for a nuclear war. Of course, if you’re in the direct vicinity of a nuclear explosion, no amount of preparation in the world is going to save you. For those who aren’t hit directly, though, survival is possible if you made the right preparations. 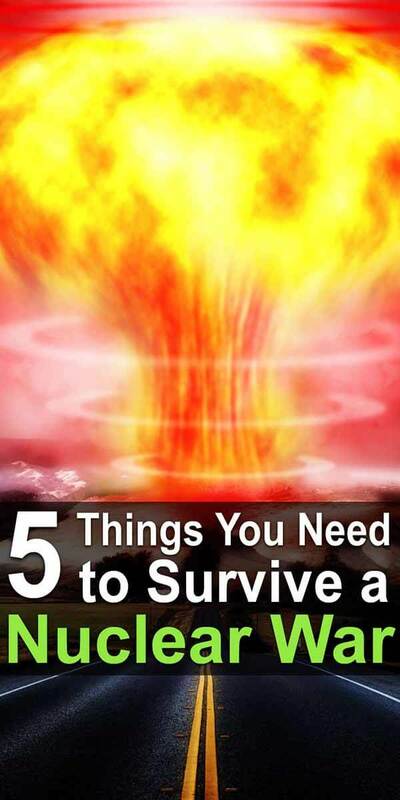 With that in mind, here are 5 things you need to survive a nuclear war. Today, nuclear warheads manufactured by advanced countries such as the United States are often much cleaner than they used to be in terms of the amount of radioactive fallout they produce. However, there is no guarantee that the nation or organization whose attack you are hit by will be using bombs that are cleaner, and even if it is a relatively clean bomb, fallout can still be incredibly dangerous, especially if it is detonated on the ground rather than in the air. With this being the case, the most important thing you can have to survive a nuclear war is a fallout shelter designed to shield you from the radioactive material that a nuclear explosion blasts up into the atmosphere. Keep in mind that fallout from a nuclear explosion can still be raining down days or even weeks after the explosion has taken place, so it’s crucial to keep your fallout shelter well stocked so that you can lay low until the threat from the fallout has passed. Even after all of the radioactive material that has been blown up into the atmosphere has dissipated, there will still be areas near the blast that will give off life-threatening levels of radiation. A reading of 750 milliSievert on your Geiger counter means that you are at risk of radiation sickness, 3,000 milliSievert and you’re at risk of radiation poisoning, and if you are exposed to 4,000 milliSievert you only have a 50% chance of survival. Of course, exposure to radiation levels of just 12.5 milliSievert are known to increase your risk of cancer by .1%, so it’s best to avoid prolonged exposure to radiation of any detectable level. Even if it doesn’t poison you right away, the long-term effects could still prove fatal. A Geiger counter will let you know the radiation level of the area you are entering, but it won’t do anything to safeguard against it. For that, you will want a radiation suit. Good radiation suits work in two ways. For one, they are lined with lead, carbon, activated boron, or other materials designed to stop radioactive particles from penetrating the suit and entering your body. This function of radiation suits is the one people are most familiar with. However, it is only one aspect of the protection that radiation suits offer. In addition to blocking dangerous particles, radiation suits also keep you from getting radioactive material on your skin and clothing. To do this, radiation suits don’t have to be with lead or carbon – they just have to completely cover your body. A large majority of the damage caused by entering a radioactive area comes from the fact that you and your clothing become covered in radioactive dust and debris, and you take that radioactive material back with you. By wearing a radiation suit, though, and washing it carefully when you return, you can avoid this danger. By far, the organ in our bodies most susceptible to damage from radiation exposure is the thyroid gland. When exposed to radiation, the thyroid absorbs large amounts of radiation in the form of radioactive iodine. The best way to shield yourself against radiation-caused thyroid damage is to take potassium iodide before and immediately after your exposure. When you take potassium iodide, your thyroid fills up with iodine and is unable to absorb any more, preventing it from absorbing iodine that is radioactive. Potassium iodide comes in both liquid and capsule forms, though you’ll want to be careful about taking it unless you absolutely have to. Taking too much potassium iodide is known to cause some adverse effects. In the event that you have been exposed to dangerous levels of radiation, though, potassium iodide can be a lifesaver. Surviving a nearby nuclear explosion is difficult enough; surviving a full-blown nuclear war will require an even greater deal of preparation. A nuclear war has the capacity to completely end society as we know it. Mutually assured destruction dictates that in the event of a nuclear attack between two countries such as the United States and Russia or North Korea, no one is getting off easy, and with the nuclear arsenals of the world’s top nuclear superpowers numbering in the tens of thousands–not to mention the possibility of nuclear weapons leaking out of Russia and into the hands of terrorists–the potential to send the entire world back to the stone age is certainly there. With this being the case, the best way to prepare for a nuclear war aside from gathering the things you need to survive the radiation is to stock up on the supplies and equipment necessary to be completely self-sufficient. This includes an ample food supply as well as the ability to grow your own food, the supplies needed to collect, purify, and store fresh drinking water, medical supplies and anything else needed to hunker down for the long road to recovery after a nuclear war has ended. After the radiation level drops low enough for short periods out of the shelter, can the garden be planted? Will the vegetables have the latent radiation that is on the soil? If so, how do you make the garden safe for planting? I think the best thing you can do is cover an area with heavy plastic sheeting. Then when the radiation level drops, you can use that land to grow a garden. The one thing for sure is the radiation is decaying, thus its emissions. Not knowing the half-life of the material one can assume it was a uranium bomb that fissioned and any fallout would be unfissioned uranium plus fission products that are non-gasseous but particles sufficiently heavy to land on the ground. Dispersion and intensity of fallout depend on many physical factors and the farther you are from ground zero the lower the levels of radiation. Then you have particles which are water soluable and those that aren’t. The water soluble particles can be drawn into the the root, stem and leaf system with concentrations in those areas. Leafy foods would be suspect. Radiation lessens going into the fruit as it is being filtered as water passes through the plant structures. Plastic covering not too bad an idea but water will be suspect. The most important factor is remember this. You need food. You must eat or die. You must drink. So drink. The long term effects of any radiation at such low levels may never happen. If you had instrumentation knew how to survey and sample and count the samples etc and do all the math, you could measure things. It is for this reason I am launching a website called nuclearguides.com ASAP in 2018. Nuclear technologies, radiation protection and nuclear assays is what I do, its my expertise for past 38 years. You asked a great question. There is much to share to others. So I need to get busy. PS, that radiation protection suit mentioned before….I never heard of anything like that. I have worn about everything made for radiation protection. I got a chuckle at the imagination of others. Nuclear isotopes that are radioactive can be learned looking at the Chart of the Nuclides. Google for one. Many show a bottom right black triangle in the square and these are fission isotopes Think Periodic Chart used for chemistry but expanded. Doomsday clock isn’t just for nuclear war, although I think it was originally made for that.